“Tell me about the last time you saw your son Levon,” I asked of Grandma Alice, who despite her frail figure, seemed an indestructible spirit. She closed her eyes and dropped her head, as if to see him. A sweet smell of corn and carne radiated from the kitchen behind us. Grandma Alice at her home near Shiprock, New Mexico. It was a strange web of circumstance that brought us all together here in Alice’s home, way out on the Navajo Reservation. Two years ago I had been passionately engaged in the writing of this very blog. Each week I sought out someone in Albuquerque who had never ridden the city bus (which was easy to do), and together we would go on a terrific adventure, rolling up and down Central Avenue or mingling with the riffraff at the bus stops. Then I would go home, edit photos, and spend hours writing up the story. For me, this was part sociological inquiry into the world of society’s leftovers, part desperate search for meaning amid an existence governed increasingly by impersonal, soulless institutions. For the people we met on the bus, it was an opportunity to tell the world about their triumphs and their struggles. For the readers, I will of course never know. Like all things, my blog project lived for a while and then died. Or at least so I thought. Two weeks ago, a message from a woman named Clara appeared in my inbox. She wanted to talk to me about one of the subjects I wrote about in my very first blog post, a man who called himself Two Crows. The news struck me hard. I remembered my encounter with Two Crows very well, yes, as if it were yesterday. Two Crows had the air of a charismatic, a great peacemaker, a prophet, I remembered. He spoke with a wondrous poetic eloquence matched neither by those of the street nor those of the tower. And he had the power, in the hail of his breath, to bring a man’s anger to heel, or to lift the spirit of she in despair. He was only thirty-three years old, and healthy as one could be under such conditions. How could he have perished? Clara and I cried together over the phone, two complete strangers, connected only by radio waves spanning a great and mysterious horizon. We cried for her brother’s soul, and we cried for our own. And then, like the midday sun interrupting a matinee at its climax, an awkward truth rushed suddenly in, bathing our magic moment with unwanted light. “The man you refer to as Two Crows in your article is the one who appears with you in the photo, right?” she asked me timidly. And so it was, Clara’s brother Levon and the prophetic man called Two Crows were in fact not the same man. We had been crying over two different people, and this sudden realization set me to crimson. The deep intrinsic meaning I had attributed to this strange encounter with Clara threatened to melt quickly away like the year’s first snowfall. And this was largely my own fault, for in the article I had described Two Crow’s overcoat incorrectly. I had described it as the very overcoat that Levon wore in a different photograph, the one in which I appeared beside him. “It’s okay,” she said with some sadness in her voice, but she was no longer crying. Attempting some consolation, I began to tell Clara what I knew of her real brother, now that we had confirmed his identity. But the truth is that I knew very little about him. Levon, who was fifty years old at the time when I met him, barely spoke at all. I don’t think he was able to speak. He smiled a lot, and he stumbled a lot. He stared stoically into the setting sun alongside me, and he pointed almost hopefully—but perhaps just blindly—at God knows what out across the endless golden skyline. Wordless as our encounter was, however, I could tell that deep down this man was a gentle soul. Perhaps his mind was broken, but he had love in his heart. That is all I could share with Clara, and it felt like so very little. To my surprise, Clara recovered from the confusion very quickly. She said that it didn’t really matter, and in a way, she believed that the man called Two Crows might have been speaking for her brother, because her brother could no longer speak for himself. Yes, yes, indeed! I thought. A prophet Two Crows might really be, a voice not for himself but for the voiceless, for Levon and for all like him whose minds have been silenced but whose spirits still yearn to speak! Clara insisted that we still come up to meet her and the rest of Levon’s family that coming weekend, despite that awkward little confusion over her brother’s identity. And of course we accepted her invitation. “I think so,” I turned my head to reply, unable to stop this interruption for the delicious calling of fresh fry bread, beans, beef, and corn, hot and steamy and ready to eat. Mike, who stands well over six feet tall and would aptly be described as a bear of man, was in fact the only man at all in this home of many women. So where were all the men? I thought to myself. Some husbands and sons were surely out at work or relaxing at home, but there was something more to this. A lot of men seemed to simply be missing. But missing where? Grandma Alice with some of her many grandchildren. Despite her arranged marriage, Grandma Alice’s had been a fruitful one, if not entirely pleasant. She bore nine children, five girls and four boys, just as evolutionary science would predict. But science would have difficulty explaining the discrepancy that followed. Like their father before them, all of Alice’s sons took to the bottle early on, and alcohol eventually killed all but one of them. One fell to cirrhosis of the liver, another to drunken bloody murder, and now Levon, hit by a passing car while stumbling across Coors Road. Alice’s sole surviving son probably would have suffered a similar fate, I was told, but some years back he found the strength within him to put down the bottle and take back control over his life. He now leads Alcoholics Anonymous support groups on the reservation and drives a big rig. Meanwhile, despite challenging times, the women were able to stay on their feet, to come together. This was largely thanks to Grandma Alice, who they refer to as the “rock” of the family, the great matriarch. As tragic as this one family’s story is, it reflects a more generalized tragedy for the Navajo and other American tribes around the country. According to the CDC and the Indian Health Service, twelve percent of all deaths among Native Americans are directly related to the problem of alcohol (more than three times the rate among non-natives), and nearly seventy percent of these deaths are among males. Car accidents and cirrhosis are the number one assailants, while homicide and suicide come in second. What, then, is the more heartbreaking tale: the loss of Grandma Alice’s three sons to the same terrible vice, or the fact that this is nothing extraordinary? “Boredom,” said one of Alice’s daughters. “No jobs. No money. No hope,” said another. There are no simple answers to such a question, of course, for the root causes of any societal pathology almost certainly lie as much in deep historical processes as they do in the decisions of individuals as they navigate the structural barriers and opportunities presented them by life. Levon’s decision to give himself to the streets instead of fathering his two daughters, for example, presents a terrific puzzle. According to his niece, Smeenie, he once spent a whole month in sobriety in hopes of setting his life straight. He lodged at a local church in exchange for custodial work. He seemed so happy, proud, and strong, she recounts. This could have been his chance to turn things around, yet despite it all—or in spite for it all—one morning Smeenie found him packing his rucksack, and she watched as he walked off down the road, never to return to the church or to sobriety. But what was it that pulled him away from life? What pulled him away from the people who loved him so dearly, those whom he also clearly loved? Was it mere boredom, or was it a force much greater, perhaps much older, than himself? Our stomachs were now full, our attention redirected. It was now definitively Alice’s turn to speak. And when she spoke, the world around her bowed reverently. “As I told you, it must have been more than a year ago. It was early spring, I know, because the winds were icy and cold. It had been raining, and when I saw him, my son Levon, he was drenched with that ice cold water from head to toe, through and through. He had his coat on, but it was drenched, too, and I know he must have been terribly cold. And in that state that he was—drunk as always, he was always drunk—he walked right up to me with his arms stretched out wide, and he tried to hug me. A long silence followed that no one dared to interrupt. An hour later Paula and I were carefully maneuvering our fragile little sedan over deep mudded gullies towards the most massive and most magnificent stone outcropping I have ever laid eyes upon. It is called Shiprock to the outsider, but the Navajo and their ancestors call it Tsé Bit’a’ í, the “rock with wings.” The evening sun blast its west face like a furnace, while the easterly winds seemed to freeze its backside. We parked the car and began prancing about to ward off the chill, but before long a strange and distracting image caught our eyes and brought us to complete stillness. Up above, way up high atop the pinnacles of those immense mirrored wings of stone, fully alight in the setting sun’s rays, there stood two enormous black birds. Suddenly and from afar, a tremendous crack tore through the sky above us, shaking the earth beneath our feet. We looked again towards the massive stone beast before us. One to the East, the other to the West, the two crows took to flight, and in so short a moment that our hearts mightn’t speak, they disappeared forever into those infinite, mysterious horizons. 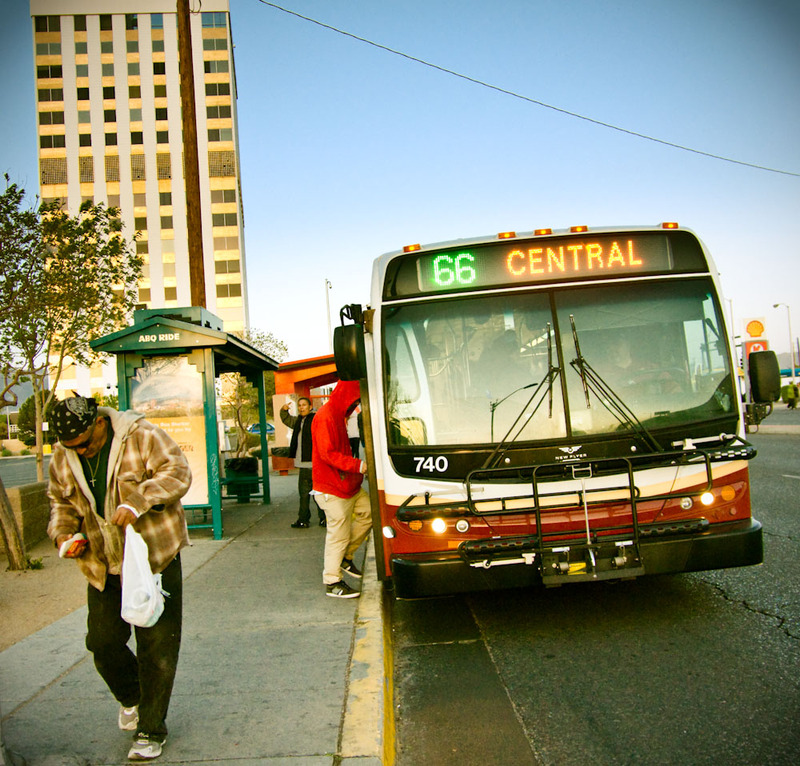 The Route 66 main line bus runs the gamut of Central Avenue from East to West. Here passengers exit and board at the corner of San Mateo Blvd, just across the street from the Bank of America building, where billionaire Bill Gates rented his very first office space.